The topic of diversity in sci-fi and fantasy has been making the rounds recently. They are genres dominated by white casts with maybe token non-white characters – and these usually male. It’s hardly inclusive. And that’s a problem. Fantasy is a genre where anything can be possible. It’s a medium by which messages, challenges and debates that would otherwise cut too close to the bone can be addressed. So why do so many people claim that having a character with black or brown skin would be tokenism or unrealistic? Excluding groups of people from your cast on the basis of “realism” in a genre that is defined by its being set in a world that is not our own is just stupid. There are several times and places in Earth’s history when people from different cultures, ethnicities and social standings came into contact with one another on a daily basis. Under the campaigns of Alexander the Great, there were Greeks, Persians and even Indians in close contact – sometimes fighting against one another, sometimes making peace. In his army, Alexander had Greek and Macedonian cavalry, Iranian horse archers, Macedonian foot soldiers and Greek hoplites, spearmen from Pontus – north-eastern Anatolia – and archers from Crete. Mostly in the ancient world different cultures were depicted by giving people funny hats (though not as stupid at that movie Immortals). You’d certainly have a few languages in there, and probably several shades of skin tones. Long-distance military campaigns afford a great opportunity to really throw in a mix of cultures, especially when one culture has perfected a particular type of fighting where others have barely considered it, as is the case with the Cretan archers. In early imperial Rome you’d see even greater diversity. The Roman Empire stretched from Britain and Portugal in the west to Judea in the east and south to Egypt and Libya. Rome itself, the centre of the empire and all the trade routes, and the destination of many commodities, would have seen people who were thoroughly white from the northern provinces, tanned from the Mediterranean, brown from the eastern provinces and black from north Africa. With a population of a million, Rome needed a lot of grain, olive oil and wine – and Egypt was Rome’s breadbasket. A large empire and good sea trade routes afforded Rome the opportunity to import large quantities of the foods it needed from another continent – and with it, the people, cultures and languages of distant lands. A fantasy world based on Rome could easily show plenty of racial diversity. Contact between China and Africa in the 15th century was strong enough that animals such as elephants, rhinoceros and even a giraffe were sent to China as tribute. In the 15th century, Chinese sailors shipwrecked off the coast of Kenya settled there, converted to Islam and married Kenyan women. The meeting of different cultures, languages and beliefs would make for a dynamic and interesting setting for a fantasy novel, all based off the desire to explore and some bad weather. In fact, there were several voyages by the Chinese towards Africa, forming routes of communication and trade. And not a European in sight. Even within Europe, at various stages of its history diversity was clear to see. Following the fall of the Roman empire there were huge movements of populations around Europe, north Africa and the Near East. In the early Middle Ages parts of Spain were occupied by Islamic Moors from Africa. In the colonial era Europeans interfaced with a variety of different cultures on every inhabited continent – sometimes in conquest, sometimes in trade. Why not set your novel in a colonial era? It needn’t feature slavery and guns as our own modern colonial era did – the ancient Greeks were sending out colonies from 750BCE, the Vikings went exploring westward in the ninth, tenth and eleventh centuries CE, and why do you think there were Chinese ships washing up on Kenyan shores in the first place? Exploration. You don’t need to base your fantasy cultures on real ones at all. A little understanding of human nature and human needs, combined with some knowledge of geography, and you can create believable, diverse cultures from scratch. Start with drawing a map, or just have an idea of the geography. You might decide to have an equatorial inland sea, dotted with islands and bordered by fertile river valleys interspersed with deserts. Because it’s equatorial, you’re naturally going to have darker skinned people – but the rivers offer routes deep inland, perhaps to regions with lighter-skinned people. The coastal regions and islands might be a mix of sea-faring cultures – perhaps with Chinese-style junk boats or, for those with better access to trees in rainforests upriver, grandiose ships more reminiscent of Viking longships, decorated with carvings. Since this population lives in a hot, humid region, I think light clothes made of linen would be most suitable, with light airy designs reminiscent of Indian saris. In the absence of vibrant dyes, they’re usually undyed or natural colours, with status shown through the quality of the fabric – or through decoration sewn onto it in the form of shells and pearls. Perhaps in the distant south, in a more temperate climate in contact with our main culture via an immense river, semi-precious stones and precious metal deposits in the ground mean the natives of that region prefer bright colours and extensive jewellery like what we’re used to seeing in depictions of the ancient Egyptians, but the coldness and dampness of their region mean the styles perhaps look more like ancient Celtic clothing. And who’s to say these southerners in the temperate climate are white? There’s no reason not to give them a more east Asian appearance, or even a native north American look. A culture that depends on the sea is going to have a lot of imagery concerning sea creatures – fish, octopi, crabs and so on. They’d probably have a deity who lives in or controls the sea, like the Greek god Poseidon. With a hot climate and minimal cloud cover, the sun might also be considered a deity. Of course, the inland regions, especially that southern temperate culture, won’t see the same significance in the sun and the sea. Their imagery and beliefs might centre more around birds and the changability of the skies, and they might practice cremation where the coastal culture is more focused on burials at sea. A large inland sea with sea-faring cultures is just the circumstance for a lot of trade, and where there’s trade, there’s diversity. People travel west to buy dyes, east for rare fruits, south for precious metals, north for fine marble for building, and when they travel, they bring their families, they set up home in the trading hubs, they mix with those they meet. By considering diversity from the outset, you can create a world in which diversity is natural and normal without it feeling “unrealistic”, by developing geographies and cultures organically rather than defaulting to pseudo-medieval European. How would you introduce diversity to fantasy or science fiction? What stories have your read where it’s been done right? One of my stories takes place in the fantasy world equivalent of West Africa during the Ghana, Mali, and Songhai Empires, and the setting is specifically the capital city of a province smack in the middle of several trade routes. So the cast is primarily dark-skinned, but there’s background and minor characters who are lighter, and later, when the main characters have to go on a long journey, they meet an even wider variety of people. And that’s not even getting into the fantasy races I made up just for this story, which include bats, dragons, and plesiosaurs, all of whom have their own ethnic groups, languages, and cultural differences, too. Sounds very cool! I find it very annoying when fantasy stories have multiple human cultures but one race of dwarfs and one of elves that are each homogenous. Humans get diversity but elves don’t? So annoying! 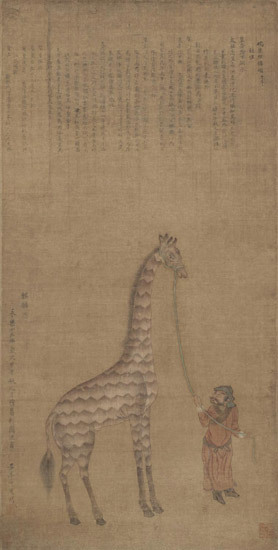 Especially love the historic image of the giraffe in China. I’d never seen that before. You make great points and I would add gender identity and sexual orientation to the broad category of “diversity”. When building from the ground up, there is no reason to take hateful or dismissive stereotypes that plague the belief systems of our world into other imagined realms. Absolutely. I’ve got this idea I want to try about about a trans character who seeks out magical answers to their problems, but I’ve got other projects I’m working on first and I’ve never been big on magic, so it’s not a major priority right now. Looking forward to having a go though. And yes, the giraffe is fantastic – the moment I saw it I absolutely had to include it.